For the past ten years, the Alpine Insurance Alberta World Cup Academy has shaped young athletes into Canada’s strongest cross-country skiers. That deserves a pat on the back. 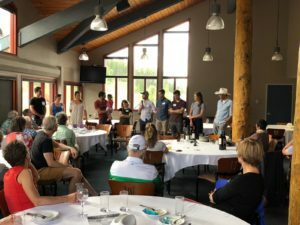 The Academy took an evening to celebrate its past, present and future Sunday (June 24) at the Canmore Nordic Centre, honouring volunteers, sponsors, athletes and coaches for their contribution to the sport. The Academy celebrated its alumni, and introduced the 2018/19 edition of the team. The board of directors also recognized long-standing board members Jean Bristow and Norbert Meier for their contributions to the sport. Here’s to another successful 10 years!